Powers/Abilities: Magda had no powers, nor did she demonstrate any particular skills, other than being a woman of peace. (Classic X-Men#12/2 (fb) - BTS) - During World War II, Magda was imprisoned in Auschwitz. (Classic X-Men#12/2 (fb) - BTS) - Magda's family and friends, actually everyone she knew, died in the gas chambers, except Magda herself. (Classic X-Men#12/2 (fb)) - Magda was saved from death at the hands of a guard by Magnus. (Classic X-Men#12/2 (fb) / Excalibur III#9 (fb)) - Towards the end of World War II, Magda and Magnus escaped from Auschwitz. Despite their physically debilitated state, they survived in the frozen woodlands. Magnus lit a fire and brought them food, though Magda was unable to stomach what he initially brought. Magnus vowed to always protect her. For a time, they lived little better than animals, yet somehow, though sick and hungry as they were, still they survived. (Classic X-Men#12/2 (fb) / Excalibur III#9 (fb)) - Magnus and Magda wandered south into the Carpathian Mountains, where Magnus found work, and they both made new friends and had a chance to catch up on the life lost in the stench and shadow of the gas chambers. They learned to laugh, and then to love; they were married and, when their daughter was born, they learned contentment. They named her Anya after Magda's mother, who had died in Auschwitz. (Classic X-Men#12/2 (fb)) - Magnus' insatiable hunger for knowledge, as well as the fact that his intellect far outstripped any of those in his simple highland village, eventually drove him to bid the village goodbye. Magda and Magnus moved eastward into the Soviet Union, hoping to win a place at a university and, though that education, the best possible future for his family. (Classic X-Men#12/2 (fb)) - Eventually they came to the Ukrainian city of Vinnitsa; Magda, who wished they had stayed in the mountains where they had been safe, was disturbed at the way people there looked at them, but Magnus dismissed it as being due to their "country bumpkin" appearance. (Classic X-Men#12/2 (fb)) - Magnus took a job working in construction, but when his employer attempted to cheat him out of his money, the angry Magnus unconsciously mentally hurled a crowbar at him. As the fearful man paid him, Magnus wondered if and how he had done such a thing. (Classic X-Men#12/2 (fb) - BTS) - That same day, Magda left Anya sleeping in their room at the inn while she went shopping. Upon returning home, Magda found the Inn on fire, with Anya trapped inside. (Classic X-Men#12/2 (fb) / Excalibur III#9 (fb)) - Magnus returned home and rushed into the inn as Magda tried futilely to ascend the burning stairs to Anya. When the stairs collapsed on them, however, Magnus' powers kicked in again, and he saved them both with a sphere of force. Realizing the power he had, Magnus led Magda outside and rushed outside, intending to save Anya. However, it was then that Magnus' employer returned with "officers of the state," attempting to arrest him for extortion and assault. As Anya began to scream from the pain of the fire burning her, Magnus tried to get free from the men, who beat him into submission; another officer restrained Magda. The employer taunted the helpless Magnus while he begged someone to help his daughter. When Anya apparently leapt to her death, Magnus could take the man's taunts no longer. His power raged to the surface and he slaughtered the entire crowd that had stood by as Anya died. Magda was appalled at Magnus' actions; his explanations availed him naught, as Magda cried out, "You're not the man I loved! You've become a monster!" The louder Magnus called, the faster and more desperately Magda ran. He tried to follow, but his beating and subsequent outburst had left him so weak that he could barely stand. The secret police showed up soon after, and Magnus was forced to hide. 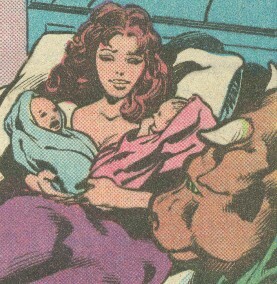 (Avengers I#234 (fb) - BTS) - Magda had not yet revealed her pregnancy to Magnus, and she did not share this information with him after she had fled. (X-Men Annual#12/3 (fb) - BTS) - Magda stayed at a village inn, but she had to leave after she ran out money. (Avengers I#186 (fb) - BTS) - Having heard of Wundagore, Magda sought asylum there. (X-Men Annual#12/3) - Upon arriving at Wundagore, Magda was surprised at the appearance of the Citadel of Science. Nonetheless, heavy with child and believing the childbirth to be imminent (see comments), she hoped the lord of the manor would take her in. (X-Men Annual#12/3 / Avengers I#186 (fb)) - Confronted by the guard, New Man Sir Gote, Magda passed out from surprise. 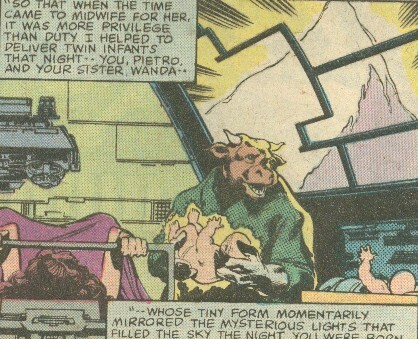 Though the High Evolutionary forbade the presence of outsiders in the Citadel, Gote reasoned that he would not deny such a very pregnant woman. He brought her to Bova. Magda suffered early contractions that apparently resolved (see comments). (Avengers I#186 (fb)) - Magda told Bova of her husband (Magneto) who had gained powers and transformed into a raving maniac whom she feared. (Avengers I#186 (fb)) - Bova cared for Magda for several weeks, during which time the two became very close. (X-Men Annual#12/3) - The Magnus-possessed Jonathon Drew scanned Magda for evidence of Chthon and found her clean. 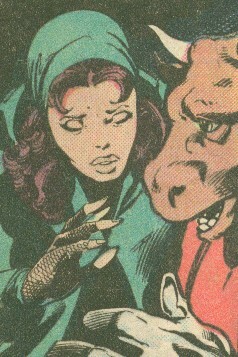 The High Evolutionary instructed Bova to not tell any of the others of Magda's presence. (Avengers I#186 (fb) / 234 (fb)) - Though Magda cared for her children, she vanished days after their birth, leaving behind a note, expressing fear that if she remained alive her husband might force knowledge of their children from her. Magda walked out into the frozen wastes to die, intending to sacrifice herself for her children. (X-Men Unlimited#2 (fb) - BTS) - After Magneto discovered where Magda had bore their children, he built a monument on Mount Wundagore, swearing that blood would never be spilled there. (X-Men Unlimited#2 (fb) - BTS) - Magneto assaulted the German army when they mobilized on Mount Wundagore. While fleeing from Magneto after unwittingly trespassing on the memorial site for Magda, Ute + Adrian Eiskalt ran into Bova just outside of her cottage. Knowing Magneto's rage, Bova urged them to "Run--save yourselves!" Comments: Created by Mark Gruenwald, Steven Grant, David Michilinie, John Byrne, and Dan Green. I think it is worth a mention that it was in Uncanny X-Men #125 (September 1979) in which it was revealed that Magda's unnamed husband from the flashback in Avengers #186 (the month before) was, in fact, Magneto -- thereby confirming that he was the true father of Quicksilver and the Scarlet Witch. There is actually no confirmed evidence that Magda did die, but there's no good reason to have not had her sacrifice herself for her children. I'm sure someone will bring her back at some point. Magda's reaction to Magneto as a mutant seems to be more based on his violent actions than his being a mutant. Though initially startled, she soon accepted the New Men. I placed the Scarlet Witch and Quicksilver's births at 1958 because that's the year that the Miss America title (with Patsy Walker) was cancelled, which seemed a reasonable year for the death of Miss America, the character; it has to have occurred long enough after 1945 for Eric and Magda Lehnsherr's daughter Anya to be a pre-adolescent in the same general timeframe (IIRC Classic X-Men implied that a few years passed between Eric and Magda's marriage and their daughter's birth), and I figure even if she was born as early as 1947, that'd work. So, yes, that would also be a relevant year for Gregor Russoff; by pure coincidence, it's also the year that the First Line formed and the year that details indicate that Namorita was born and Namor was rendered amnesiac. So it was a pretty important year all around. X-Men Annual#12/3 makes it appear as if Magda arrived on Wundagore and gave birth within hours (believing that her water had broken before her arrival), as opposed to weeks later as told in Avengers I#186. Perhaps she suffered a severe cramp which caused her to leak a large amount of urine. Pregnant women frequently leak urine when coughing, sneezing, etc., so it could be expected with a severe cramp, and as Magda had no medical knowledge, there's no reason to think she had to be right about her water breaking...especially not an uneducated woman from a small European village in 1950's. I'm sure I missed some appearances; just let me know, and I'll add them. I had Classic X-Men#19/2 on my list, but I only see Magnus referencing the events of #12/2, with nothing new in reviewing the issue. The dialogue from the flashback in Excalibur III#9 is almost identical to that of Classic X-Men#12/2, though the images are different. Lennsherr (or however you spell it) or not? The trend seems to be going against their names ever being Lennsherr (or whatever), though Claremont is still using the name in flashbacks as recent as last month. I'd prefer to leave it as Lennsherr, myself.